RTGS is the settlement infrastructure operated by the Bank of England for electronic sterling transactions, including payments arising from the high-value CHAPS payment scheme. LSM was introduced into RTGS for CHAPS payments in April 2013. It works by letting submitted payments ‘queue’ for a period of time in RTGS, awaiting incoming CHAPS payments to match against, then offsetting the liquidity needed by each paying bank to ultimately settle (Davey and Gray, 2014). In simulation tests (Denbee and McLafferty, 2013) it was estimated that liquidity savings of about 30% were possible. And though there’s been a lot of flux, at their best, CHAPS banks weren’t too far off that (about 25% savings in May 2015, Figure 1), albeit with some encouragement to be a bit more liquidity-savvy. However, as of October 2015, daily CHAPS liquidity usage briefly peaked at a level higher than that prior to LSM being introduced (Figure 1). And even at its lowest point, CHAPS liquidity usage could have been lower still: there was still potential for banks to better align their outbound and incoming payments using the liquidity tools provided to them. Why does liquidity usage matter? If a bank lacks liquidity to make payments, this could foster financial instability: a lack of liquidity was one of the key elements that precipitated the collapse of Lehman Brothers on 14 September 2008 (Ball et al, 2011). CHAPS liquidity requirements also feed into the amount of liquid assets banks are required to hold in their liquidity portfolios at the Bank of England, and so lower liquidity usage could free up funds for banks to invest more profitably elsewhere. The Bank of England also has an incentive to reduce system-wide liquidity usage in CHAPS, as the size of the Bank’s intraday balance sheet is greatly determined by its provision of liquidity to CHAPS banks. Put simply, lower liquidity usage allows the financial system to function more smoothly. With the LSM project, the Bank of England provided banks with a well-stocked toolbox to reduce their CHAPS liquidity requirements, as well as showing them how best to use the tools. Intraday, settlement banks can decide which payments should be available for matching and which ones should settle immediately; they can limit their financial exposure to certain banks in CHAPS, or the entire CHAPS network; or they can decide to postpone sending payments to certain banks altogether for a period of time. So in principle, the CHAPS banks should be able to economise on their liquidity usage. But there is nonetheless a limit to the power banks have over their CHAPS liquidity requirements. With a few exceptions, banks do not usually have to process payments as soon as they receive them. They are able to retime payments, within certain parameters, in order to limit their liquidity usage (Denbee et al, 2014). However, for a large chunk of the liquidity-hungry CHAPS payments the parameters are tight. This is particularly true for overnight loans, which account for around a third of CHAPS payment value. The market convention is for overnight loans to typically be made late in the day and repaid in the morning. Their very nature means that these payments do not match against each other. Regular borrowers in the money markets are bound to experience their highest liquidity usage when they repay the overnight loan early in the morning despite having excess funds in the evening. Regular lenders are bound to experience their highest liquidity usage when they lend out large amounts of cash late in the afternoon, despite being awash with liquidity in the morning. Figure 2 illustrates this difficulty. 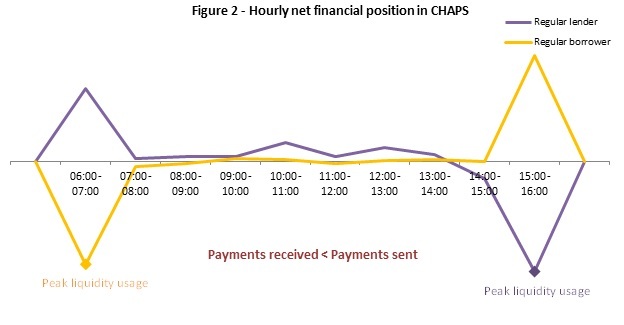 Each bank’s daily CHAPS liquidity requirement is determined by the moment in the day in which it experiences its lowest negative financial position in CHAPS. In Figure 2, banks would ideally retime payments to match against each other; moving the outbound payments to a period of the day in which they currently receive a greater value of payments in order to offset their liquidity usage. The market convention of the overnight loan market prevents this from happening. Due to their size and stubbornness, these payments play a large part in determining the lower bound to daily CHAPS liquidity requirements. But Figure 2 is highly stylised – in reality, these are not the only payments that matter. Payments are being made all the time, and queuing large payments for just a few minutes longer until an inbound payment arrives to offset it could lead to a reduction in peak liquidity usage. The right tools to do the job? As has already been described, LSM provides the tools to make the marginal retiming of payments easier. It took time for banks to familiarise themselves with these tools, as shown in Figure 1. However, over time they became more efficient and there were noticeable liquidity savings. But there is still room for improvement. Some banks let too many large interbank payments out early in the morning, and some banks don’t let enough out; others consistently set their maximum financial exposure in CHAPS higher than is necessary to settle their payments punctually. Banks still aren’t using LSM optimally, and Figure 1 is testament to this. Liquidity requirements in CHAPS are monitored by regulators and helps determine the amount of liquid assets banks are required to post at the Bank of England. But broadly speaking, high liquidity usage in CHAPS is only a threat to a bank’s stability if there is a chance that there might not be enough of it. There is little risk of that in a world of QE and the vast reserves that entails, even on days where liquidity usage is highest. It’s hardly surprising that liquidity usage is often managed sub-optimally – at the moment, it just doesn’t matter that much. Liquidity usage is, at its base, a financial stability concern, and therefore a Bank of England concern. Given this, one could argue that the Bank should do more than it does presently to help banks save liquidity. Some international RTGS systems allow banks to submit payments in advance of the ultimate settlement date (‘forward-dating’). This could allow a large batch of payments to be settled in a single matching cycle early in the morning, reducing liquidity usage. Other systems charge banks less for payments that are submitted early in the day, encouraging banks to temporally align payments and creating more opportunity for matching. The difference that the Bank could make to CHAPS liquidity requirements with such policies is likely to be small, and is still dependent on banks responding to marginal incentives and using the toolbox offered to them effectively. Given the current toolbox is being used sub-optimally; it is not clear that providing CHAPS banks new tools to manage liquidity will lead to significant further savings. More fundamentally, it’s a hard sell to base payment systems policy, investment and technological change on the desire to reduce CHAPS liquidity usage when the banks themselves have less cause to be concerned about it, and when the risk to financial stability is currently quite low. I’ve highlighted two barriers to liquidity saving in RTGS. The first – market convention – is difficult to overcome. There is a significant chunk of liquidity-hungry payments that cannot be retimed, and hence set the lower bound for liquidity usage. The second is how effectively CHAPS banks use LSM. I noted that in the current liquidity-abundant environment, the incentive to reduce liquidity usage in CHAPS is lessened, which helps explain why the liquidity management tools at the disposal of CHAPS banks aren’t always used in the most effective manner. These barriers don’t necessarily explain why liquidity usage has increased recently; the evolution of the UK payment landscape best explains that. But they do explain why CHAPS liquidity usage might not decrease markedly any time soon. The suboptimal use of the LSM suggests that there are gains to be made from a better use of the tools banks currently have before providing new liquidity management tools – and the Bank should consider the importance of liquidity usage in the current financial environment as well as the role of market convention before deciding to invest in such tools. David Seaward works in the Bank’s Market Services Division. Previous Post From Berlin to Basel: what can 1930s Germany teach us about banking regulation?